We, the International League of Peoples’ Struggle (ILPS), condemn the aggression carried out by Turkey on the Kurdish canton of Afrin in Northern Syria using aerial bombardment, artillery fire and tanks in its continuing campaign to suppress the Kurdish people’s liberation movement. The Kurdish People’s Protection Units (YPG) have vowed to fight back to protect Afrin which is part of Rojava-Northern Syria, the Kurdish autonomous region administered by the Democratic Union Party (PYD). The ILPS supports the Kurdish people’s struggle for national self-determination and their aspiration for a democratic self-administration in Rojava-Northern Syria. Even under the conditions of civil war, the people of Rojava successfully held a referendum in which they overwhelmingly expressed their desire to establish a Democratic Federalism of Northern Syria within a unified federal Syria with equal rights among the different ethnic groups in Rojava-Northern Syria: Kurds, Arabs, Syriacs, Assyrians, Armenians, Turkmen, Circassians, and Chechens. The Syrian government has denounced Turkey’s attack on its territory calling it an act of aggression. Russia has called on both Turkey and Syria to calm down and settle problems through negotiations. Afrin is formally under the protection of Russian and Syrian forces. Turkey had originally gone along with the US in its campaign of “regime change” against Assad. For this anti-Assad campaign, the US mobilized Saudi Arabia, Qatar and Israel and various jihadi terror groups such as the Al-Qaeda affiliated Al Nusra Front, the so-called Free Syrian Army, armed and trained by Turkey, and the Islamic State financed and armed by Qatar and Saudi Arabia. The entry of Russia into the war upon the call of the Syrian government for assistance turned the tide in favor of the Assad government, with the Syrian Arab Army (SAA), under cover of Russian air power recovering most of the territory lost to IS and other jihadi groups. As a result, Russian influence and power is vastly growing in the region. With its newly acquired status, Russia has encouraged Turkey to distance itself from the US with the promise of Turkey playing an important part in the Russian gas pipeline that would supply gas to Europe. Russian air power had previously destroyed the oilfields that had come under the control of IS that sold oil to Europe under Turkey’s protection. Another reason for Erdogan’s cozying up to Russia at the expense of the US is the US support to the YPG in the fight against the Islamic State. Russia has embarked on a diplomatic offensive opening another negotiating track in Sochi–aside from the UN-sponsored Geneva track–which successfully brought together the Syrian Government and many of the Syrian opposition groups. This initiative has gotten the support of Iran and Turkey, effectively sidelining the US. Russia has pressed for the inclusion of the Kurds in the negotiating table putting Turkey in a bind. The US was forced to support the YPG because the latter had proven to be a highly effective force against such US-created Frankensteins as IS and other jihadi groupso . Having failed in the campaign to oust Assad, the US and its regional lackeys, Saudi Arabia and Qatar are now doing everything in trying to maintain presence in Syriafor future trouble-making. The Kurdish liberation movement in Northern Syria has emerged more powerful militarily and politically in the course of the civil war. It has been able to set up a functioning political structure to run its autonomous democratic administration in Rojava-Northern Syria and an effective armed force in the YPG to defend its territory. The PYD and YPG have played their cards well in the complex situation of the US-instigated Syrian civil war with various world and regional powers pursuing their own agenda. Their decades long struggle for national self-determination has taught the Kurdish people that they have to be strong and smart in order to achieve both their long-term and short-term objectives. 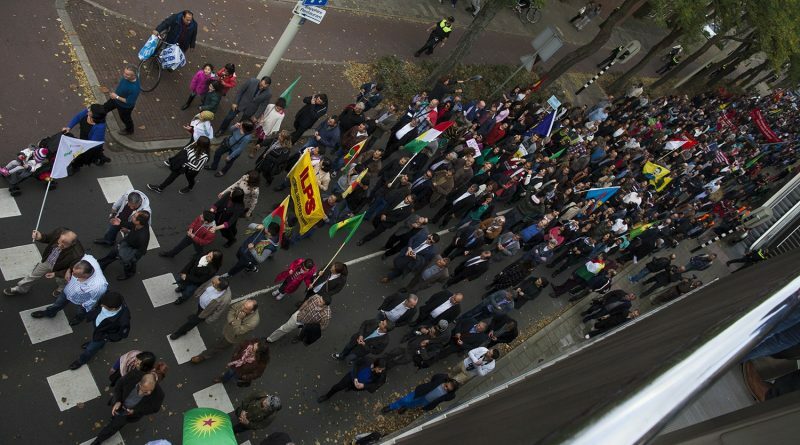 We reiterate our firm support for the Kurdish people’s right to national self-determination. We call on progressive organizations throughout the world and all people of good will to condemn the reactionary policies of the Erdogan regime and give their support to the Kurdish people’s just struggle for democracy and national self-determination.